So our newest emerging series is the sherbert kids for this June, 2015! This is, as the name says, a kids series, but what is really exciting is this will probably have the new fur we have seen on the pop'n ribbons and hatters! (A guess made from the new fur trend). From what we can see there are 36cm, 16cm, and 12cm that will be available. Maybe more, but no info yet. Photos taken from TOM's stock photos. Yay or Nay? Post below! Personally I'll be grabbing the 16cm orange! They're so cute! Although I do wish that the orange and purples came in the larger sizes!! I pre-ordered all the 16cm as well as soda-chan in 36cm! I really wanted Orange, Soda, and Budou-chan so I figured I might as well get the set. Awesome! If I had the money to drop on a set~ I usually prefer outfits though so for this series I'm just getting the little orange guy because it's such a classic sherbert color! I need the orange omg.. The 16cm kids are sooo cute, and i think that's the best size for the kids! The large kids sizes never stand up hahah it's kinda cute though! i'm primarily interested in the orange, but also the purple and blue! i'll be waiting until tokitti's shop gets them to purchase but i think they're precious. sometimes i just really, really like the more plain series without all the accessories. they're usually the best to cuddle with and carry around. @eurufu wrote: They're so cute! Although I do wish that the orange and purples came in the larger sizes!! I'm going to love this series. I preordered the set of 16cm and Blue in the 36cm. ;u; Can't helps it. Needs the pastels... I'm probably going to get some ball chains of orange and purple from Tokitti or Rosy when they get them. Thanks Tiffany for the info! Ill add it! I'm interested in the orange, and possibly the purple one too! But I'm definitely going to wait until Tokitti and Rosy get them in stock and list them with their own photos before I decide what to get. I feel like TOM's photos are a bit over-exposed (I think that's the term? They look very white lol) so they may not give the most accurate look at the colors. The best colors~ I might have to grab myself a blue one in the large size x: I'm already getting the small orange! I want a little blue one because I thought of a good name. I wanted to name him Moondrop. (I know he's supposed to be blue moon and the name just came to me.) But I know the purple is rare so if I have leftover money I will get it. Definitely want the orange too...I want to name an Alpacasso Pearl and I think I could get away with naming an orange or purple one. Who am I kidding? The white one should be Pearl and the blue one Moondrop. 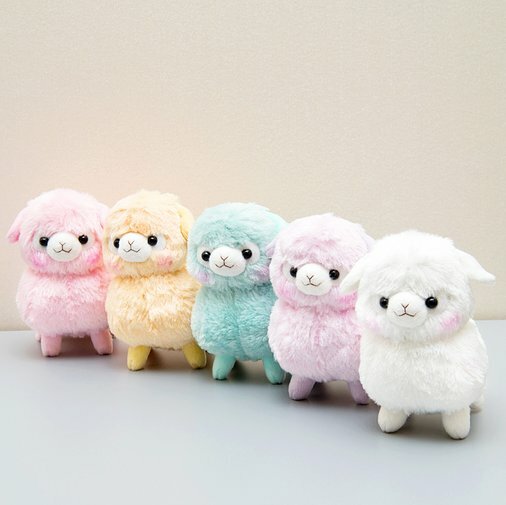 I should just order a set but I'm not keen on light pink alpacasso so I'd wanna sell the pink guy. If they had a 36cm orange it would be love at first sight. They need more uniquely colored large kids and babies. FYI, free shipping on TOM for orders over $50 - easy to do if you are ordering the set because it's $39.99 and you just need $11.01 more. Ordering $50 worth of products is actually cheaper than ordering the set and paying for shipping! LOL. Just thought I'd share my discovery with prudent alpaca shoppers out there. misticalcat wrote: FYI, free shipping on TOM for orders over $50 - easy to do if you are ordering the set because it's $39.99 and you just need $11.01 more. Ordering $50 worth of products is actually cheaper than ordering the set and paying for shipping! LOL. Just thought I'd share my discovery with prudent alpaca shoppers out there. Cool! I am not buying a set, but this is helpful knowledge for those who are! it definitely doesnt seem as orange as say, the pop'n ribbon girl. It's like a nice pastel orange, or nummy sherbet. @alpacaxy thats exactly what i thought about it! I think they know people love pastels. 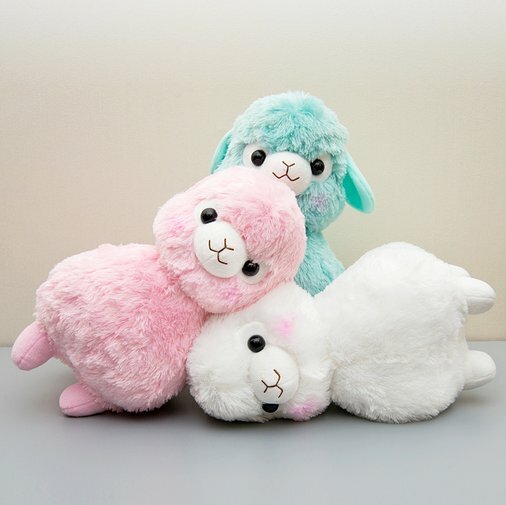 if i order the set i think I'll give away the white and pink, which i dont want, to my sweet young cousins who are into alpacasso now. (i have lots of white alpacas already because i love white ones and i am not a fan of the light pink!) right now they have the mint and orange pop'n ribbons.